The 44.62 metre motor yacht Lady May, listed for sale by Burgess, has received a price reduction of €4,100,000. Built in aluminium by Dutch yard Feadship, this yacht for sale was delivered to her very experienced owner in 2014 named Como. Innovative superyacht Lady May so impressed the judges at the 2015 Showboats Design Awards that she went on to win three Neptune trophies: two for naval architecture and exterior design at Dubois Naval Architects and one for the interior design by RWD. Accommodation is for 10 guests in five cabins consisting of a master suite, two doubles and two twins, all with full en suite bathroom facilities. Her master suite is particularly impressive with sweeping glass and extensive views thanks to holes cut in the bulwarks. In the saloon, a key element is the bar, which spills over from the saloon to the aft deck. When entertaining, the aft glass doors and the window that bisects the bar disappear, making one large social space, connected by adjacent stairs to the upper deck. A novel touch is the fact that the saloon’s entire seating area, including the coffee table and carpet, can rotate 360 degrees on a cushion of compressed air to face the aft deck, the bar, the 82-inch television or the dining table. A mirrored floating staircase links the different decks and_ Lady May _boasts an unprecedented use of glass panels all the way round the yacht, maximising the natural light throughout. Twin 1,900hp Caterpillar diesel engines give her a range of 3,000 nautical miles at her cruising speed of 14 knots. 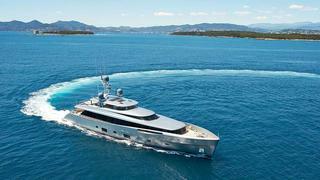 Lady May is now asking €24,900,000.